Before the rise of online holiday booking, people regularly used offline travel agents to book trips. This was a time-saver but it cost a lot for the privilege. 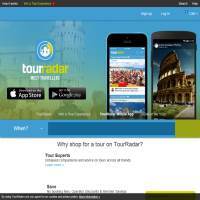 TourRadar.com bridges the divide between a self-planned trip and using a travel agency, allowing you to pick your ideal locations but let them do all the hard organizational work. You also pay no booking or organizational fees as they take their cut from the various amenities you use along the way. In theory, it’s win-win for everyone. So, how might you go about arranging your trip? First, you’ll probably want to work out where you wish to visit. If you don’t have any ideas, then you can easily check the popular tours on the website. These range from city tours of the western coast of the US to jungle treks in Africa. The site provides useful information about each tour including the duration, key destinations, start and end points, and the age range it’s suitable for. In particular, the age range item is interesting because it means you can plan to be with people of a similar age to you if you wish. The events are also tailored towards particular ages, so younger tours might be more inclined to visit hectic party areas, whereas tours for slightly older people might focus more on sightseeing and hiking, or history tours. It all depends on what you want! Once you’ve decided on a location, you can check reviews to see what other people thought of the experience, as well as specific notes on the tour guides employed to take you around. There is information around the website, although it would really help if there was a searchable FAQ with substantial answers to help you when you’re stuck. If in doubt, you can contact the support staff using a Live Chat, which is a great way to get instant and insightful help. You can book without help or have support in doing so. You can then pay online without having any intrusive credit checks. There are a few extras to explore including a check lists and a downloadable app. TourRadar members also write blog posts on their experiences if you’d like to get some first-hand understanding of what a tour is like. With the advent of online holiday booking, travel agents have taken a hard hit in the market place. However, if you’ve ever tried to organize your own trips abroad, then you’ll realize it can be a difficult process. You have to arrange the flights, hotels, tours of the sights (if you know what they are), restaurants, trains, planes and automobiles to get you around whilst you’re abroad, etc. So a site that spans the divide between using a travel agency and self-planning your trip makes a lot of sense. Overall, there’s a lot to like about Tour Radar. If you’re happy with the price of the tours (they can still cost more than booking it yourself as they come with a guide and arrange a lot of things for you) then we’re sure you’ll find something to suit you. Whilst the site’s information is lacking in some areas, you can generally get a good impression of the experiences on offer. You won’t pay a thing until you book a tour, meaning you can take your time and pick the tour that’s perfect for you.